As people notice, I am an avid user of Emacs for most of my professional and personal coding. I have things set up such that the center of my development environment is a shell (eshell), and most of my interactions are with emacs buffers from there. Recently when I purchased my iPad Pro (10.5”, 512 GB, LTE, with Pencil and Smart Keyboard) I was very surprised to find out that there was such a large group of people who did a lot of their professional work from an iPad. The iPad is a remarkably capable device in its own right, even without the apps that let me commit to git or edit text files in git repos. Out of the gate, if I did not work in a primarily code-focused industry, I am certain that I could use an iPad for all of my work tasks and I would be more than happy with it. With just Notes, iWork and the other built-in apps even, you can do literally anything a consumer would want out of a computing device. As projects and commitments get more complicated though, you begin to want to be able to write code from it. My Macbook died recently, and as such I’ve taken the time to try to get to learn how the iPad workflow is a little more hands-on (this post is being written from my iPad even). 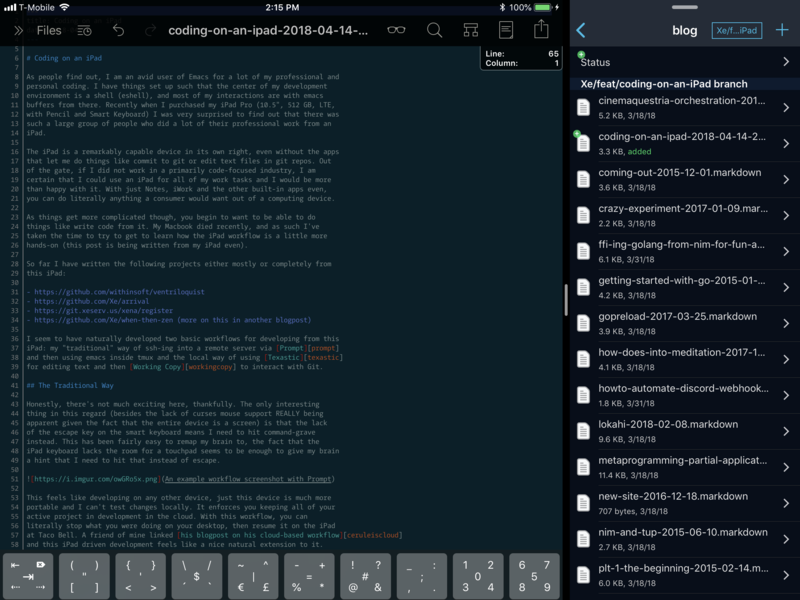 I seem to have naturally developed two basic workflows for developing from this iPad: my “traditional” way of ssh-ing into a remote server via Prompt and then using emacs inside tmux and the local way of using Texastic for editing text, Working Copy to interact with Git, and Workflow and some custom JSON HTTP services to allow me to hack things together as needed. Honestly, there’s not much exciting here, thankfully. The only interesting thing in this regard (besides the lack of curses mouse support REALLY being apparent given the fact that the entire device is a screen) is that the lack of the escape key on the smart keyboard means I need to hit command-grave instead. This has been fairly easy to remap my brain to, the fact that the iPad keyboard lacks the room for a touchpad seems to be enough to give my brain a hint that I need to hit that instead of escape. This feels like developing on any other device, just this device is much more portable and I can’t test changes locally. It enforces you keeping all of your active project in development in the cloud. With this workflow, you can literally stop what you were doing on your desktop, then resume it on the iPad at Taco Bell. A friend of mine linked his blogpost on his cloud-based workflow and this iPad driven development feels like a nice natural extension to it. It’s the tools I know and love, just available when and wherever I am thanks to the LTE. Of all of the things to say going into owning an iPad, I never thought I’d say that I like the experience of developing from it locally. Apple has done a phenomenal job at setting up a secure device. It is hard to run arbitrary unsigned code on it. Texastic is pretty exciting. It’s a simple text editor, but it also supports reading both arbitrary files from the iCloud drive and arbitrary files from programs like Working Copy. In order to open a file up in Texastic, I navigate over to it in Working Copy and then hit the “Share” button and tap on “Open in Texastic”. By default this option is pretty deep down the menu, so I have moved it all the way up to the beginning of the list. Then I literally just type stuff in and every so often the changes get saved back to Working Copy. Then I commit when I’m done and push the code away. This is almost precisely my existing workflow with the shell, just with Working Copy and Texastic instead. There are downsides to this though. Not being able to test your code locally means you need to commit frequently. This can lead to cluttered commit graphs which some people will complain about. Rebasing your commits before merging branches is a viable workaround however. There is no code completion, gofmt or goimports. 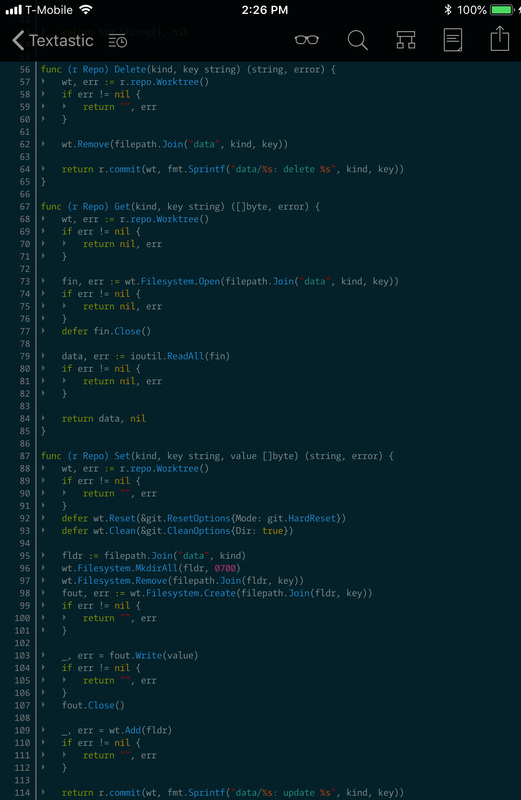 There doesn’t seem to be any advanced manipulation or linting tools available for Texastic either. I understand that there are fundamental limitations involved when developing these kinds of mobile apps, but I wish there was something I could set up on a server of mine that would let me at least get some linting or formatting tooling running for this. Workflow is very promising, but at the time of writing this article I haven’t really had the time to fully grok it yet. So far I have some glue that lets me do things like share URL’s/articles to a Discord chatroom via a webhook (the iPad Discord client causes an amazing amount of battery life reduction for me), find the currently playing song on Apple Music on Youtube, copy an article into my Notes, turn the currently active thing into a PDF, and some more that I’ve been picking up and tinkering with as things go on. There are some limitations in Workflow as far as I’ve seen. I don’t seem to be able to log arbitrary health events like mindfulness meditation via Workflow as the Health app doesn’t seem to let you do that directly. I was kinda hoping that Workflow would let me do that. I’ve been wanting to log my mindfulness time with the Health app, but I can’t find an app that acts as a dumb timer without an account for web syncing. I’d love to have a few quick action workflows for logging 10 minutes of anapana, metta or a half hour of more focused work. 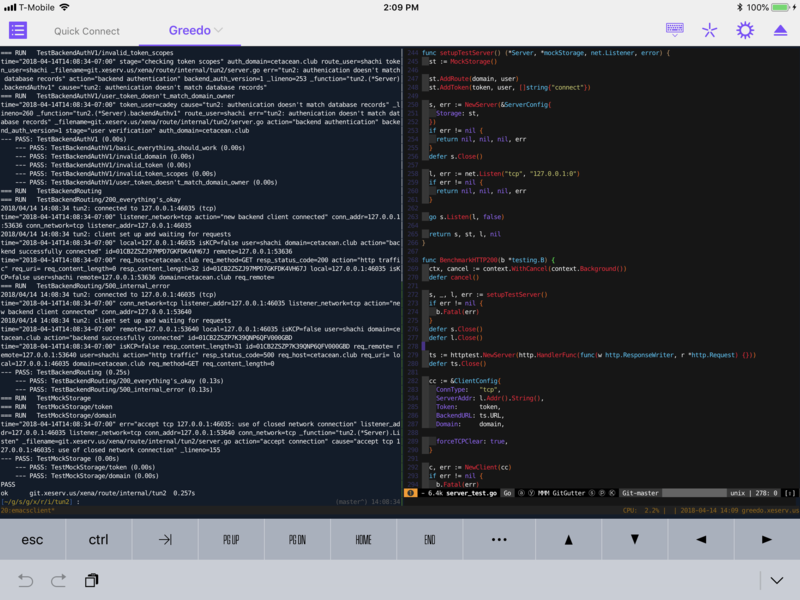 The iPad is a fantastic developer box given its limitations. If you just want to get the code or blogpost out of your head and into the computer, this device will help you focus into the task at hand so you can just hammer out the functionality. You just need to get the idea and then you just act on it. There’s just fundamentally fewer distractions when you are actively working with it. You just do thing and it does thing.